Former President Olusegun Obasanjo on Sunday attacked President Muhammadu Buhari, accusing him of plotting to rig the general elections. Mr Buhari is seeking re-election on the platform of his party, APC. The presidential and National Assembly elections will hold on February 16. In an open letter titled “Point for Concern and Action” which he distributed to journalists at a press conference held at his house at the Olusegun Obasanjo Presidential Library, Abeokuta, Mr Obasanjo also alleged that the president was acting like a former military dictator, Sani Abacha. 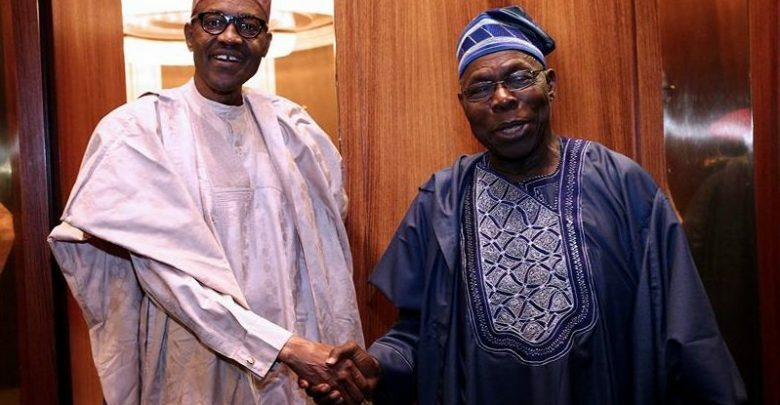 “Buhari has succeeded in deceiving us the first time and we will be fools to allow ourselves to be deceived the second time,” Mr Obasanjo wrote. Mr Obasanjo was one of the millions of Nigerians who supported Mr Buhari in the 2015 presidential election. He has since withdrawn his support for the president, accusing him of incompetence and nepotism. Mr Obasanjo then claimed that what is happening in Nigeria under Mr Buhari can be likened to what Nigerians witnessed under a late military dictator, Sani Abacha. Mr Abacha, who ruled Nigeria between 1993 and 1998, died in office while trying to perpetuate himself in office. “He went for broke and surrounded himself with hatchet men who on his order and in his interest and at high costs to Nigeria and Nigerians, maimed, tortured and killed for Abacha. Buhari has started on the same note on the same path in mad desperation,” Mr Obasanjo claimed. He then alleged that the president and his party are recruiting collation officers who are already awarding election results. He said the current plan is to drape the pre-determined results with a toga of credibility and also use violence of unimaginable proportion which will be unleashed in high voting population areas across the country to precipitate re-run elections. Mr Obasanjo’s letter comes despite repeated promises by President Buhari to ensure free and fair elections. The presidency is yet to react to Mr Obasanjo’s latest outburst. BELOW IS THE FULL STATEMENT BY MR OBASANJOPOINTS FOR CONCERN AND ACTIONBy Chief Olusegun ObasanjoI am concerned as a democrat who believes that with faithful and diligent practice of democracy, we can get over most of our political problems and move steadfastly and surefootedly on the course of stability, unity of purpose, socio-economic growth and progress for all.Democracy becomes a sham if elections are carried out by people who should be impartial and neutral umpires, but who show no integrity, acting with blatant partiality, duplicity and imbecility. For all democrats and those carrying out the process of elections, there must be the redline that must not be crossed in tactics and practices of democracy.I personally have serious doubt about the present INEC’s integrity, impartiality and competence to conduct a fair, free and credible election. And if the INEC is willing, will the ruling party and government allow it? From what we saw and knew about Osun State gubernatorial election, what was conclusive was declared inconclusive despite all advice to the contrary.The unnecessary rerun, if viewed as a test-run for a larger general election, would lead people to expect incidences of deliberately contrived, broken or non-working voting machines or card readers, confusion of voters as to their voting stations, inadequate supply of voting materials to designated places, long line to discourage voters and turning blind eyes to favour the blue-eye political party of INEC because the Commission’s hands will be tied to enable hatchet men and women to perform their unwholesome assignment. The transmission and collation of results are subject to interference, manipulation and meddling. If the INEC’s favourite political party wins with all the above infractions, the result will be conclusively declared and if not, there will be a ‘rerun’, the result of which is known before it is carried out. I know that I am not alone in being sceptical about the integrity of INEC and its ability to act creditably and above board. But we are open to be convinced otherwise.The joke about INEC would seem real. The INEC was asked if the Commission was ready for the election and if it expects the election to be free, fair and credible. The INEC man is reported as saying in response, “we are ready with everything including the results!” God save Nigeria! It is up to Nigerians to ensure that the redline is not crossed in safeguarding our fledgling democracy. And if crossed, appropriate action must be taken not to allow our democracy to be derailed.A friend of mine who is more credulous and who claims to be close to the Chair of INEC keeps telling me that INEC will retrieve its image and reputation by conducting the coming elections with utmost integrity and impartiality. I am not sure as I believe more in action than in words and in past record than in promise. The track record of the present INEC is fairly sordid and all men and women of goodwill and believers in democracy must be prepared for the worst from INEC and their encouragers and how to get Nigeria out of the electoral morass that the Commission is driving us into. To be forewarned is to be forearmed. A battle long forewarned does not embroil the cripple nor catch him unawares. A word is sufficient for the wise. The labour of Nigerian democracy heroes must not be in vain.Some men of God would hold President Buhari to his word on free, fair, credible and peaceful elections. I am a realist and I reiterate that I go by track record. Therefore, I am not persuaded by a track record of hollow words, impunity, insensitivity and ‘I-couldn’t-care-less’ attitude, or by the sanctimonious claims of any candidate and his campaign staff. I will only believe what I see. This is a time for vigilance to fight to safeguard our votes and defend our democracy. The price of liberty and sustenance of our democracy is eternal vigilance and appropriate reaction to ward off iniquities. We must all be ready to pay that price and not relying on hollow words of callousness. The derailment of Nigerian democracy will be a monumental disaster comparable to the disaster of the Nigerian first military coup.While Nigerians must not allow such a disaster to happen nor take such an affront lying low, the international community who played an admirable role in warning INEC, of course, to no avail on the Osun State gubernatorial election and who have been warning all political parties must on this occasion give more serious warning, send more people to the field to observe and work out punitive measures against INEC and security officials especially the Police and politicians who stand to gain from INEC’s misconduct, which is obviously encouraged by the Executive Arm of Government and who must be held responsible for the violence that will follow. Such measures can vary from denial and withdrawal of visas from the people concerned and from their families to other more stringent measures including their accounts being frozen and taking them to International Criminal Court, ICC, if violence emanates from their action or inaction. Nigeria must not be allowed to slip off the democratic path nor go into anarchy and ruin. No individual nor group has monopoly of violence or gangsterism. And we must not forget that in human interaction, reactions are normally greater than action, though opposite.It is no use, at this juncture, to keep lamenting about the failure, incompetence, divisiveness, nepotism, encouragement and condonation of corruption by Buhari administration as there is neither redeeming feature nor personality to salvage the situation within that hierarchy. You cannot give what you don’t have. Bode George put it bluntly in his statement of December 3, 2018 when he said:“The other day, the Vice-President of Nigeria, Professor Yemi Osinbajo – a learned man, an enlightened person in all parameters – was seen at various markets in Lagos State and Abuja distributing N10,000 each to market women. What an absurdity! It was indeed an obscene display of executive recklessness and abuse of office. Pray, where did the money come from? Was it budgeted for in the appropriation law? In more civilised nations, Osinbajo would have been impeached and prosecuted for gutting our collective treasury.”What an act by a Senior Advocate of Nigeria lawyer, number 2 man in the Executive hierarchy; and what is more, a pastor of one of the Christian movements led by a revered, respected and upright church leader, Pastor E. A. Adeboye. Osinbajo must have gone for, “if you can’t beat them, join them”. A great pity indeed and which makes people ask the questions, “Any hope?” Yes, for me, there is hope.Osinbajo has shown the human weakness and proved the saying that the corruption of the best is the worst form of corruption. His explanation that it was their government programme can only be construed to be very shallow and lopsided, if not an outrightly idiotic programme.Traders in rural and sub-urban areas of Nigeria are many more than those in urban areas and they are much poorer than traders in Lagos, Abuja and other cities. They need more attention and greater help. Are they to be confined to the heap of perpetual poverty? What of those who are not traders? They are not entitled to hand-out and they can languish in penury? And what about millions who have lost their jobs in the last three and a half years? The timing is also suspect. Those who criticise the action are called evil but they are not evil as they know what they are doing and saying, and they love Nigeria and Nigerians not less than the likes of Osinbajo. They are not devils incarnate; they are patriots.What is the connection between taking the number of PVC (Permanent Voters Card) of the recipient of the N10,000 doled out to ‘traders’ and the forthcoming election? There is something sinister about it, and Professor Osinbajo, of all people, should know that. With collusion of the INEC officials and card readers not made to work, anybody quoting the PVC number may be allowed to vote as the revised Electoral Bill was not signed. And if that happens all over the country, it will be massive rigging indeed. The Chairman of INEC must stand firm and carry out his duties with competence and unbending neutrality. Card readers must be used without fail and accreditation must be completed and number ascertained and made public before voting commences as was done in 2015.Amina Zakari has become too controversial a figure to be able to give assurance of free, fair and credible election for INEC. President Buhari and her family have declared that there is no blood relationship but there is relationship through marriage and that is more than enough for the good lady to step aside. A judge does not sit in judgement over a case once he or she becomes a cause for controversy or one side in the case has strongly objected to the judge.Madam Amina Zakari should, in honour, stay out and not be seen as a source of contamination of the election. Otherwise, it will be difficulty to deny the rumour that she is being assigned to Collation Centre for one duty only – to write out figures that are not results of the voting in the field on fake results sheets without water mark or on genuine results sheets which she will have access to as a Commissioner. Amina Zakari is not the only Commissioner that can be in the Collation Centre. Let the INEC Chairman act boldly and impartially and prove his absolute neutrality and responsiveness to contribute to make the election peacefully free, fair and credible. His integrity needs to be transparently demonstrated.We should remember that there had been reports of INEC sponsored rigging in the past, and also with INEC officials through collation and with officials being put in party coordinators’ dresses and working for the political party favoured by INEC and also putting the dresses of other parties on INEC-favoured parties and police uniforms on INEC-favoured parties to rig all the elections for the favoured party. Like all of us, INEC knows all these and it should devise means to make sure they do not happen. But will they? One way will be to only allow card readers to be means of authenticating voters and where there is no such authentication, it should mean no voting. The second is to use only identity cards with watermarks issued by INEC itself to party officials only for identification of political party coordinators, officials and agents and not political parties dresses or arm and wrist bands which anybody can wear for purposes of identification on election duty or function. Both the Presidency and the National Assembly must so far be commended for adequately providing funding as confirmed by INEC, and therefore funding cannot be an excuse for poor performance by INEC.President Buhari and his hatchet men in the coming election think that the judiciary must be primed in their favour. Hence, the Chief Justice of Nigeria, Justice Walter Samuel Nkanu Onnoghen, has been harassed and prosecuted for non-declaration of his assets without following the Constitution and the law, just to make him conform or set him aside for a Buhari man to take over or act, as President Buhari and his people believe no stone should be left unturned to rig Buhari in. It seems to be a ploy to intimidate the judiciary as a whole in preparation for all election cases that will go before them. Where and how will all these stop?Typically, with overwhelming outrage and condemnation, we are told that the Presidency denied knowledge of the action. But the Vice-President told us that the President knew of the action on Saturday night for everything that has been prepared for Monday morning. Haba VP, it doesn’t happen that way. Nobody should take such measure against any of the four in hierarchy below the President or any of his ministers without his knowledge and indeed his approval. But if that can happen to the Chief Justice of the Federation, the fifth man in the hierarchy of government, without the knowledge let alone the approval of the President, then it speaks for the type of government we have which means the President is not in charge let alone being in control and no Nigerian must take anything for granted. We are all unsafe and insecure under such an administration. And enough of it! Buhari’s apologists will not stop at anything to try to cover up his administration’s inadequate performance and character. A constitutional liberal democracy cannot thrive without an independent and insulated judiciary from the executive and the legislature.Nigerians must wake up and stop these acts of wanton desperation tantamount to mental incapacity to run the affairs of Nigeria wholesomely.Life and living are anchored on trust. But if I trust you and you deceive, cheat or disappoint me the first time, it is shame on you. However, if I allow you to do so the same thing for me the second time, I do not only have myself to blame, I must be regarded as a compound fool.Buhari has succeeded in deceiving us the first time and we will be fools to allow ourselves to be deceived the second time. Buba Galadima, who knows Buhari very well as a confidant and National Secretary of Congress for Progressive Change, CPC, the Buhari’s party before it joined in forming All Progressives Congress, APC, has warned us this time around that no matter what he promises, he cannot change his character and attitude. He describes him as inflexible, insincere, dubious, intolerant, never accepts responsibility when things go wrong and impervious to reason and advice for change. If you cannot change your mind, you cannot change anything is the assertion of George Bernard Shaw.Even when figures, facts and statistics are made clear to Buhari, he keeps repeating what is untrue, either because he cannot understand or for mischief purposes and that places him on the level of a pathological liar. He believes he can get away with impunity and deceit as he seems to have done on many occasions in the past. Buba Galadima’s position is well complemented by Dr. Auwalu Anwar on the APC, CPC, TBO and Buhari’s character and attitude in his yet to be launched book, “Politics As Dashed Hopes in Nigeria”. It is also a stunning revelation. Anwar clearly pointed out, “the brazen display of incompetence, insensitivity and irresponsiveness by delusional party, CPC, leadership at all levels”.Buhari was the leader of the party. Bola Tinubu’s statement about Muhammadu Buhari in 2003 is fairly prophetic, “Muhammadu Buhari is an agent of destabilisation, ethnic bigot and religious fanatic who, if given the chance, would ensure the disintegration of the country. His ethnocentrism would jeopardise Nigeria’s national unity.”Junaid Mohammed was eloquent on the issue of nepotism. But if as we were told that Buhari is nepotic because he does not trust others, why should others trust him to continue to put their fate and life in his hand.Trust begets trust. They cannot be trusted for ‘sensitive’ appointment but they can be sent out to campaign for his re-election. Who is fooling who?What is happening under Buhari’s watch can be likened to what we witnessed under Gen. Sani Abacha in many ways. When Abacha decided that he must install himself as Nigerian President by all means and at all costs, he went for broke and surrounded himself with hatchet men who on his order and in his interest and at high costs to Nigeria and Nigerians maimed, tortured and killed for Abacha. Buhari has started on the same path in mad desperation.From available intelligence, we have heard of how Buhari and his party are going about his own self-succession project. They have started recruiting collation officers who are already awarding results based on their projects to actualise the perpetuation agenda in which the people will not matter and the votes will not count. It is the sole reason he has blatantly refused to sign the revised Electoral Reform Bill into law.His henchmen are working round the clock in cahoots with security and election officials to perfect their plan by computing results right from the ward to local government, state and national levels to allot him what will look like a landslide victory irrespective of the true situation for a candidate who might have carried out by proxy presidential debate and campaigns.The current plan is to drape the pre-determined results with a toga of credibility. It is also planned that violence of unimaginable proportion will be unleashed in high voting population areas across the country to precipitate re-run elections and where he will be returned duly elected after concentration of security officials as it happened in Osun State. We are monitoring them and we call on all democrats across the world to keep an eye on the unfolding anti-democratic agenda of President Muhammadu Buhari.This is the time for preventive measures to be taken otherwise Nigeria may be presented with a fait accompli with impunity and total disregard of all pleas.His scheme bears eloquent testimony to this road similar to Abacha whom he has praised to high heavens and as an arch-supporter and beneficiary from Abacha, he has seen nothing wrong done by him. It is clear from all indications that Buhari is putting into practice the lessons he learned from Abacha. Buhari has intimidated and harassed the private sector, attacked the National Assembly and now unconstitutionally and recklessly attacked and intimidated the Judiciary to cow them to submission.I was a victim of Abacha’s atrocities against Nigeria and Nigerians – high and low. At the height of Abacha’s desperation for perpetual power, he did not brook any criticism because Nigeria was seen as his personal property. You must go along with him or be destroyed. All institutions for ensuring security, welfare and well-being of Nigeria and Nigerians particularly the Police, the Military and the Department of State Services (DSS) were abused and misused to deal with critics of Abacha and non-conformists with Abacha.Today, another Abacha Era is here. The security institutions are being misused to fight all critics and opponents of Buhari and to derail our fledgling democracy. EFCC, Police and Code of Conduct Tribunal are also being equally misused to deal with those Buhari sees as enemies for criticising him or as those who may not do his bidding in manipulating election results. Criticism, choice and being different are inherent trade mark of democracy. If democracy is derailed or aborted, anarchy and authoritarianism will automatically follow.Today, as in the day of Abacha, Nigerians must rise up and do what they did in the time of Abacha. Churches and Mosques prayed. International community stood by us Nigerians. I was a beneficiary and my life was saved. Well-meaning Nigerians took appropriate actions and made sacrifices, some supreme, some less than supreme but God had the final say and He took the ultimate action.God of Nigeria is a living God and a prayer-answering God. Nigerians must cry out to God to deliver Nigeria. Here again, I have been threatened with arrest and extermination but I will not succumb to intimidation or threats. Maybe I should remind those who are using probe as a threat that I have been probed four times by EFCC, ICPC, House of Representatives and the Senate and Buhari has access to reports of these probes. But I have also challenged Buhari and the criminals around him to set up a probe on the same allegations and I will face such probe in public. But I know that these criminals cannot withstand a Police inquiry let alone clinical probe on the past public offices they held. My fervent prayer is that President Buhari may live to see the will and purpose of God for Nigeria.My final appeal to him is to desist from evil with manipulation and desperation because evil has repercussion especially as man who should watch and be mindful of his self-acclaimed and packaged integrity.At the end of the day, those who goad you on will leave you in the lurch. You will be left alone, naked and unheralded. In defeat, which must be Buhari’s fear leading to desperation, he and his co-travellers can still maintain modicum of decency, and exhibit fear of God in their actions. We have been told that governance has been abdicated to a cabal. Now, campaigning has been abdicated to ‘jagaban’. And it is being authoritatively stated that he would not join any presidential debate. Nigerians will not allow the elections to be abdicated to INEC and Police to give us false and manipulated results. I personally commend the President for yielding to popular outcry to let the former Inspector-General of Police, Ibrahim Kpotun Idris, go when he is due as he had the track record and history of being assigned to rig elections for the incumbent. It was alleged that he was sent to Kano for that purpose in 2015. He was already deploying his Commissioners of Police on similar mission before his exit. We must all encourage the new Inspector-General of Police, Mohammed Adamu, to tread the path of professionalism, even-handedness, respect and new image for the Police.While Nigeria must appreciate Buhari for the little he has done and allow him to depart for home in peace if he allows free, fair, peaceful and credible elections, we must also tell ourselves that Nigeria deserves better at this point in time than what Buhari is capable of offering. History will note that he has been there. Nigeria now needs a man with better physical and mental soundness, with an active mind and intellect.Let me say again that Nigeria belongs to all Nigerians and exists for the benefit of all Nigerians and non-Nigerians who desire to live or do business in and with Nigeria. The attitude of “it is my turn and I can do what I like” with impunity will not last because Nigeria is created by God and it will outlive all evil machinations and designs against the overall interest of Nigeria.Before I conclude, let me assert that the security situation has deteriorated with kidnapping everywhere and Boko Haram more in action and nobody should deceive Nigerians about this.With the teaming up of Boko Haram and Islamic State’s West Africa Province (ISWAP), Boko Haram is stronger today militarily than they have ever been. Boko Haram has also been empowered by the Nigerian government through payment of ransom of millions of dollars which each administration disingenuously always denies. With ISIS being liquidated in Iraq and Syria, Africa is now their port of concentration. Soon, they may take over Libya which, with substantial resources, is almost a totally failed state. When that happens, all African countries North of Congo River will be unsafe with serious security problems. The struggle must be for all West African, Central African, North African and most East African States. Nigeria has to play a vanguard role in this struggle as we have much to lose. This administration has reached the end of its wit even in handling all security issues, but particularly Boko Haram issue, partly due to misuse of security apparatus and poor equipment, deployment, coordination and cooperation.Finally, those Nigerians that are being intimidated or threatened by this Administration must trust in God and stand firm. Tough times do not last forever, but tough people invariably survive tough times. This is a tough time for almost all Nigerians in different respects, but the people’s will shall triumph. All people who have registered to vote with their PVCs must never allow anybody or anything to deny or deprive them of the right of performing their fundamental civic duty of voting and sustaining democracy. Establishment of democracy and its sustenance is second to attainment of independence in our political life, leaving out the victory of the civil war. We shall overcome.